The lower extremities of the body has both deep and superficial veins. Compared to the deep veins, superficial veins have fewer valves, but deep veins run in a manner that is parallel to the corresponding artery, serving the same organs. The posterior and anterior tibial veins of the foot track up the knee’s posterior and anterior region. 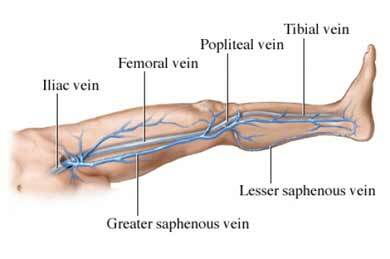 These regions then combine, creating the popliteal vein. This vein receives the blood from the knee- oxygen depleted blood to be specific. The vein that is just above the knee becomes the femoral vein. It tracks up to the thigh, receiving an oxygen deprived blood from the vein that supplies the groin- the deep femoral vein. Going slightly upward is the great saphenous vein. It turns into external iliac vein, and later it will go across the inguinal ligament’s lower part. The external iliac vein is formed by the conjoining of the internal iliac vein and the pelvis, and it rises to the sacroiliac joint. When this particular vein and the pelvis conjoins, there forms the common iliac veins- left and right. These come together, same level with the fifth lumbar vertebrae, creating the inferior vena cava. On the other hand, the superficial veins have two saphenous veins- the small saphenous veins and the great saphenous veins. These run under the skin, near to the side of the posterior aspect of the leg, originating from the foot’s lateral side. It will meet with the popliteal vein at the back of the knee joint. The great saphenous vein is the longest vein in the body of humans, and it is the one commonly excised during by-pass surgery to make way for false vessels. It is originally from the foot’s medial side. On the leg’s medial person lies the thigh and the legs, which joins the femoral vein. If a superficial vein is removed due to dysfunction, it is the deep veins that take care of the drainage that occurs within the veins.